If you are short call options in a stock or an Exchange Traded Product (ETP) like SPY or IWM you need to be aware of ex-dividend dates. If your calls are in the money, even barely, your options may be assigned right before the security goes ex-dividend—and then you may have a problem. For example, let’s say you hold a credit call spread position: short calls with lower strikes and long calls at higher strike prices. If your short calls are assigned the night before the underlying goes ex-dividend you will wake up to find yourself no longer with an option spread, but short the security and half of your option spread remaining. You’ve collected the entire time premium from your short call position—you’ll only be down the intrinsic value of the call, the amount it was in the money. Since you were short the security when it went ex-dividend you now owe the dividend on the security. That amount will be deducted from your account when the dividend is distributed. Your potential worst case loss from your position has been increased by that amount. Do you have the margin in your account to support the short position in the underlying? If not you will shortly be getting a “courtesy” call from your broker suggesting that you add funds or liquidate your short position. There will be a deadline. If the security you just went short is “hard to borrow” you will be getting a call from your broker. Your short position exists, but actual shares have to be borrowed to sustain it more than a couple of days. Extra fees may be involved, or if shares can’t be found to borrow you’ll have to cover the position. Is your spread position in an IRA? If so being short a security is a definite problem—not allowed by the IRS. You must cover the short within a day or two—if not your broker will do it for you. Luckily this will not result in a “free riding violation” because the cash generated by your short sale will be available in time to cover the purchase. Call owners with in the money (ITM) options will typically exercise their options the evening before the ex-dividend date. Holding the calls through the ex-dividend would cost them money because the underlying security usually drops in value when it goes ex-dividend. At market open the drop in the securities’ price will usually roughly match the dividend amount. In addition to assignment risk, the other thing to watch with ex-dividend dates is distortion in the implied volatility (IV) of options. For example, the IV of deep ITM calls will be distorted because the market will not give you a profitable low-risk trade (e.g., a covered call with deep ITM calls virtually certain to be assigned). You can create this position, but the premium from selling the calls will be non-existent, and therefore only risk and no profit. At the money (ATM) calls will also have reduced IVs. Normally these won’t be assigned because they will have premiums higher than the dividend payout. 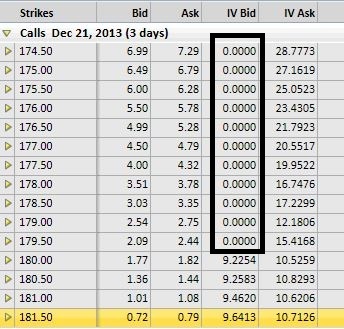 On the ex-dividend date you’ll see their IV’s jump up—just enough such that the call prices don’t move despite any drop in the underlying. No easy money here. Sit tight and take the risk that the options be assigned—not all ITM calls will be exercised. The deeper they are in the money, the higher the likelihood they will be assigned. One of the advantages of options on indexes like SPX (S&P 500) and RUT (Russell 2000) is that they don’t pay dividends—hence no worries about ex-dividend dates. For special dividends, option strike prices are often adjusted to protect option holders from unforeseen corporate actions. For more see Profiting from Special Dividends. It’s possible to use options to lower risks while collecting dividends, but it’s not a slam dunk. For more information see Dividend Capture With Covered Calls.